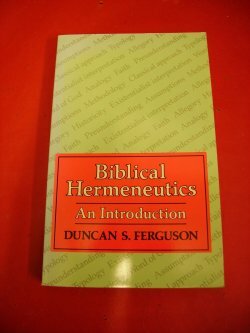 A comprehensive survey, Biblical Hermeneutics covers the field with an openness of perspective. Ferguson's well-organized introduction is an impressive resource for understanding and performing the task of biblical interpretation. 220pp. N.B. Head and tail of spine slightly rubbed. Fading to spine and spine edge of covers. Corners slightly bumped.